Easily my most popular article on this site is my suggestion for the perfect two-week Italy itinerary. It’s ideal for the first-time visitor, but not everyone has two solid weeks of vacation time to put toward an Italy trip – or you’ve got two weeks, but you’re hoping to visit more than just Italy in that period of time. Either way, if a week is all you’ve got set aside for Italy, here are some options for a one-week Italy itinerary. And if you want to take charge of your own trip, here’s my step-by-step guide on how to make your own Italy itinerary. First things first – when I say “one week,” I mean one week’s worth of work or school days, meaning you’ll be taking five days off. The actual itineraries involve you flying out on a Friday night or Saturday morning and not flying home until Sunday of the following week, though, so the time you’re gone is actually more like eight-nine days. I’m trying to squeeze as much vacation time as possible out of one week for you. Second, this itinerary – like my two-week itinerary – is focused on what I call Italy’s “Holy Trinity” of Rome, Florence, and Venice. There are different options for day trips and other stops that will add different flavors to your trip, depending on which you choose, but the basic premise is that you haven’t been to Italy’s big three before. Third, I strongly recommend that you choose lodging in the historic center in each destination, purely to eke out even more time spent exploring. Sure, you may save a bit of money by booking a hotel on the outskirts. And when you need to take the bus or Metro to the attractions each day, that’s time you’re not actually visiting the attractions. Staying closer to the sights can give you more vacation time. Finally, in order to maximize the amount of time you spend exploring Italy itself – and not in transit – this itinerary is designed around what’s known as an “open-jaw” airline ticket. This means you’ll fly into one city and out of another, rather than backtracking at the end of your trip. These are typically around the same price as a simple round-trip ticket, and they’ll give you much more time on the ground. 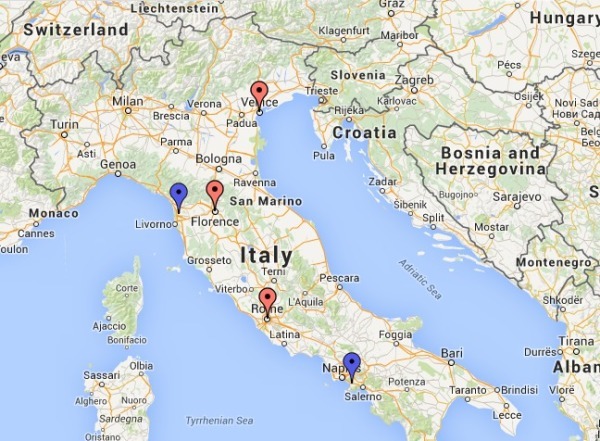 Here are some tips to finding cheap airfare to Italy. 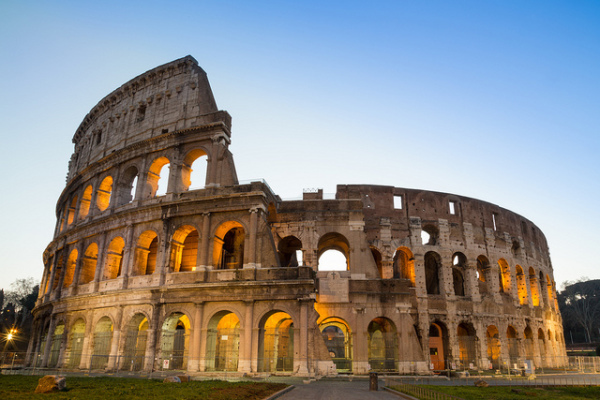 Because this itinerary not only includes Italy’s big three but also one of its most popular tourist attractions – Pompeii – it’s a winner for travelers who love checking must-see sights off their travel wish lists. It’s also great for history fanatics who get chills at the notion of walking the same ancient cobblestones that the ancient Romans did. You’ll fly into Venice (VCE) and out of Rome (FCO). You can take the train everywhere, so there’s no need to rent a car in Italy. The number of nights you spend in Venice will depend on just how long your “week” is. If you’re squeezing a full nine days out of a week-long trip, stay two nights. It’s worth it. The optional side trips are listed to give you some suggestions if you want to cover more ground, but you could easily spend a day in Venice and two full days in Florence with no need of any other city’s distractions. In Rome, after a day trip to Pompeii, you can also be completely content in The Eternal City for the rest of the time – or a side-trip to Ostia can give you a chance to see the excavation of another ancient Roman city plus a visit to the beach, all within a half-hour train ride from Rome. Most of us have that friend who’s been to Italy and just can’t stop gushing about Siena. There are lots of good reasons for that, so why not go see it for yourself? You’ll get time in Italy’s big three, plus a little extra time in this quintessentially Tuscan town (an overnight stay makes it even better). You’ll take public transportation for the whole trip, so there’s no need to rent a car. The train will get you nearly everywhere, though the more efficient route from Florence to Siena is by bus. Anyone who wants to skip Siena and use that extra day to wander a bit more aimlessly in Tuscany can certainly do so – for that, you’ll be happier renting a car for a day or two. The optional side trips are listed to give you some suggestions if you want to cover more ground, but you could easily spend a day in Venice and two full days in Florence with no need of any other city’s distractions. To many, summer trips to Italy don’t quite feel complete without some time near the sea. This itinerary option includes a swing through Liguria, with two nights in one of the five villages that make up the Cinque Terre. They’re no longer sleepy fishing villages – they’ve become supremely popular with American and German backpackers and hikers, particularly. They’re still beautiful, whether they’re on or off the beaten path. The beaches here are not among Italy’s best, but the one in the biggest Cinque Terre town (Monterosso al Mare) is relatively good-sized. You can take the train everywhere, so there’s no need to rent a car. Trains from the Cinque Terre to Florence often require a change in Pisa, so stash your bags at the train station’s luggage office and catch the bus into the center to see the Leaning Tower of Pisa. You don’t need more than two hours to see the tower, baptistery, and cathedral, and it’s a fun way to break up a travel day. The most popular hiking trail in the Cinque Terre is the one linking the five villages, so it’s also the most crowded. There are lots of other trails throughout the National Park that covers the area, however, so if you’re keen to escape the crowds hire a hiking guide or get a very detailed trail map. This is another itinerary for summer trips, when just looking at the water isn’t enough. Spending time on the glittering Amalfi Coast gives you a chance to get on the beach and into the water for a couple days at the end of your trip. Keep in mind that during the summer, these beach towns are incredibly popular with vacationing Italians as well as foreign visitors. Book lodging well in advance if possible. You’ll fly into Venice (VCE) and out of Naples (NAP). Schedule your flight out of Naples later in the day so that you can make the trip from the Amalfi Coast – that will save you from needing to relocate to a hotel in Naples for your last night. You’ll take public transportation for the whole trip, so there’s no need to rent a car. For the Amalfi Coast, there’s no train service, so you’ll take the bus from Sorrento. You have several options for towns in which to base yourself on the Amalfi Coast. Sorrento isn’t technically part of the Amalfi Coast, but it’s similar – and it’s a transportation hub for the area, making it a good option if you’re keen on day trips. The better beaches are in places like Positano and Amalfi, however. Note that Positano in particular is a very vertical town – you’ll be climbing lots of stairs to get to and from the beach. We fly into Treviso/Venice but then plan to got to FLorence, Cinque Terre, Siena and leave flying out from Pisa in afternoon. In what order do you suggest this type of trip w/ about 1 night per location, its a 6 day total trip and hope to travel mainly by train between locations. Well, with only a 6-day trip, I’d say you’re trying to do too much. 🙂 But if you really only want to spend one night in each place, then that’s up to you! Taking the train is the best option for this trip, too – Trenitalia goes to all those citeis. we will be in Rome for a week long conference. 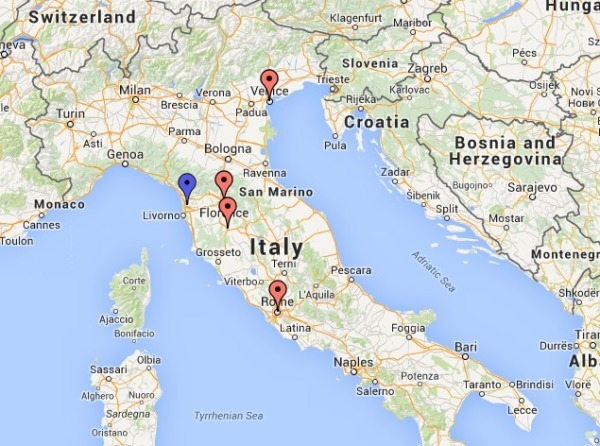 Will be in the rest of Italy for a week (7 days) What would be the most important highlights. Want to get the true flavor of Italy, not just touristy. I think the article above is a good place to start for the answer to your question, Clarise. I’d also suggest, if you want to venture away from the highlights I’ve listed above, that you read through my tips on how to create the perfect Italy itinerary for any trip. Thank you for this it is fantastic. We get married in Sorrento next month and we are planning to spend the following week travelling north (by car) to Siena / Florence then on to the lakes. Any more top tips or must-sees that aren’t listed here? There’s plenty, it’s all over the site! 🙂 Browse through the travel guide (the menu item at the top of every page), from which you should be able to find everything you need, either from links within text or related links on the right-hand sidebar of many articles. Happy hunting! (And let me know if you’re looking for something specific that you can’t find.) Congrats on your upcoming wedding! This is really great! I’m planning my honeymoon in October for about 11-12 days. I’m debating between Cinque terre and Amalfi coast in addition to the “Holy Trinity”. I’m leaning towards Amalfi coast since I think the weather will be better in October and both have similar scenery(or so I have heard), but I keep reading that it gets very busy in Amalfi coast? What do you think? I was on the Amalfi Coast in October one year, and it was not only not busy, it was chilly and rainy half the time! In October, you really don’t know what you’re going to get weather-wise. Read about some of the things to keep in mind when you’re planning a trip to the Amalfi Coast outside the high season, including potentially unpredictable ferry schedules. We are staying in Soriano for a week and want to maximize our time without feeling rushed and still enjoy our vacation. Any advice to how far we should venture? We are planning a full day winery/olive oil/cooking class tour while in Soriano. We are thinking about 1 or 2 days in Rome and booking a private tour guide while there. Any other suggestions on places we should visit on our trip? It will be the first time in Italy for both of us. The tips in this article about how to plan the perfect Italy itinerary would probably help you, even if you’re only looking for day trips. One of the big things to consider is how long it takes to get from place to place, or how challenging it is by public transit. And then it’s up to you what seems a “reasonable” option for day trips. Of course, if you have a car, that gives you a lot more freedom (although I would strongly recommend you don’t drive into Rome!). Soriano looks like it’s not far from Viterbo, which I hear has a charming city center. There are Etruscan ruins in Tarquinia, further toward the coast. Orvieto to the north might be another lovely day trip option. This is such an amazing post, thanks so much!!!! I’m planning to be in Italy in October and was wondering if you had recommendations on “tall chic boots” that are also comfortable!! 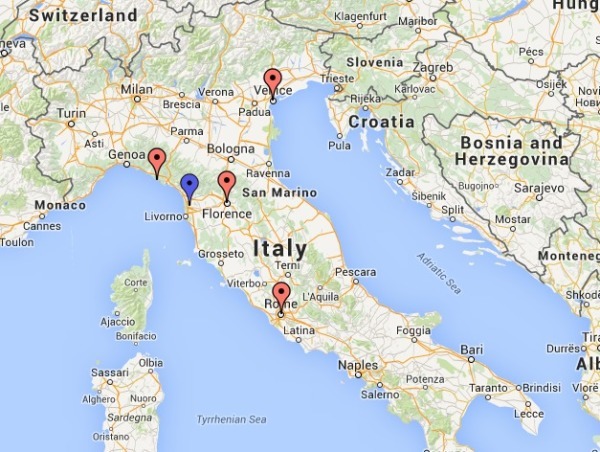 Planning to start in Venice, then Florence, and then Rome. I’ll also be in Ireland, Scotland, and Scandinavia before Italy, so i’ve been looking atwarmer boots, but am afraid they might be too warm . . ?! Any recommendations on good not too warm but nice & comfy boots?? My favorite travel boots are linked under “shoes” in my article about what to pack for an Italy trip. I’ve had them for years now – I recently had the soles replaced – but I’m not sure if that specific model is made anymore. That brand has lots of options, though, if you see another style that strikes your fancy. Hello, we are traveling to Rome and Venice and are looking to add one more city to our stay. We will be in Italy from Dec 31-Jan 10. Do you have any suggestions on a city to visit that would be enjoyable during the winter? Thanks so much! I think as long as your itinerary consists of mainly indoor things – museums, churches, galleries, etc. – then just about any Italian city would fit the bill (as long as there are things you want to do there, of course). It really depends on what you want to see/do. 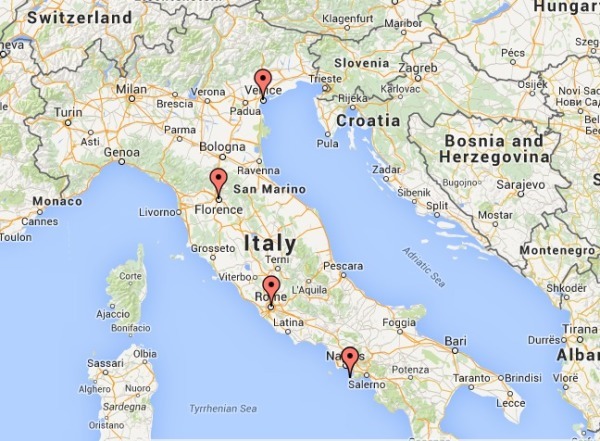 Here’s some information about visiting Italy in the winter, and here’s a list of the regions of Italy. The latter page has a brief overview of major cities or tourist destinations in each, so maybe one of them will spark your interest. I’d at least consider Florence, Verona, Perugia, and Bologna, and smaller places that might be nice (depending on what you want to do) are Orvieto, Assisi, and Siena. Thanks for the wonderful information here. I’m planning to reach Italy on 22nd June, for a week. I really want to visit all four places. Please let me know if I should increase/decrease half a day from any city so that I can enjoy most in each of them. I don’t know how you’ll be able to see both Cinque Terre and Pisa in one day, especially since it’s a travel day. I think you need to read my article about how to plan an Italy itinerary – it would be really good for you to understand transportation times. Florence: 25 June – 27 June (2.5 days). While I’m in Florence, I’m planning to visit Pisa on evening of 25 June. Please let me know your thoughts on this plan and if I should make any changes here. I think as long as you’ve researched the transportation time and you’re happy with it, then the itinerary is great. 🙂 It has to be good for YOU, not for anyone else, since you’ll be taking the trip! We will be in Italy March 7-13 (only 6 nights). Fly in and out of Rome. We would love to see Rome, Venice, Pisa and Sorrento, but not sure if this possible. I’ve been going over train schedules and ways to fit it all in. In your opinion, if I have to delete one, which one? Since it will be early March, what are your thoughts about Sorrento/Amalfi Coast? Better to wait for a summer/early fall trip for that area of Italy in your opinion? Personally, yes. I wouldn’t want to get all the way to the Amalfi Coast only to have it rainy the whole time, keeping you indoors. You might luck out with good weather (though not beach weather in early March), but you’re just as likely (if not more likely) to get cold and rainy weather. Here’s some information on traveling in Italy in March, and more general information about the weather in Italy. I think the information in the article above is my best advice on one-week itineraries in Italy. The cities you mentioned are all included, and you can add on a day trip here or there depending on what you want to see. I do think that you wouldn’t need to have a car to see Venice, Florence, and Rome. You can read more about visiting Italy in December here. If you haven’t already, I recommend going through the suggested steps in my article about how to plan the perfect Italy itinerary for any trip. In the case of your questions, I’d focus on the transportation times in particular, since that will help give you an idea of how much time you’ll actually have left in each place to explore it. I think trains are going to be your best bet, so that makes it easy to research travel times. Hi Jessica, I am going to Italy for 1 week Monday – Monday. I am flying in and out of Pisa. I plan to do Pisa – Siena – Florence – Cinque Terre – then back to Pisa to fly home. Do you think thats the best order transport wise? Also is there any places you recommend over the ones I’ve chosen? Thank you! I’d suggest you go through my article about making the perfect Italy itinerary, as it will answer some of your questions about route order. It’s important to know travel times, too, since you’ll be moving around a lot in one week, so you know how much time you have in each spot to explore. Thanks for this amazing planner. I am thinking about road tripping to Italy soon. This is such an amazing and helpful post for me. I love how thoroughly you have described everything, it is going to be very helpful for my drive-off. Thank you, your blog is great!! and Positano and maybe skipping Naples. What do you think? I want to go to the amalfi mostly for the landscapes and the food not necessarily for big city stuff but I don’t know if I’ll regret skipping Naples. It really depends on what you’re most interested in doing, and how long you want to spend in transit. I’d suggest looking up how long it will take you to get from city to city, keeping in mind that the towns on the Amalfi Coast are not served by trains (only buses and, in season, boats). If you think you’ll have gotten your fill of cities after Florence and Rome and you’ll be more interested in seaside scenery, then yes – the Amalfi Coast is a great option. My buddy is getting married in Croatia in June 2019 and starting to look at timing. We would probably do a few days in Croatia before the wedding in Dubrovnik then head to Italy for about a week. Is there a reason you don’t recommend Tuscany? My wife loves wine but I am sure anywhere you go has that. Thoughts? Tuscany is included in each of these options – Florence is the Tuscan capital. 🙂 Of course, you could easily spend an entire week in Tuscany alone, if you wanted to. And yes, wine is everywhere in Italy.